At last year’s TechCrunch50 conference, Socialwok made a big splash, winning the award for best demopit startup and launching its enterprise-friendly, FriendFeed-like layer for Google Apps. 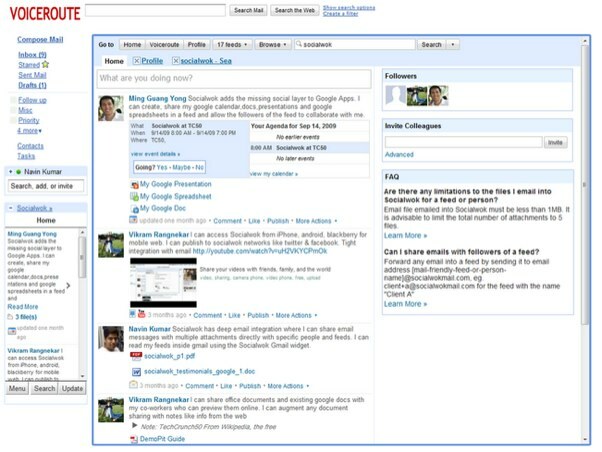 The web-based application was praised for launching a social network that wrapped around the very unsocial Google Apps. Today, the startup is launching a gadget to allow users access all the features of Socialwok without leaving Gmail. Previously, you could access Gmail, YouTube, Google Calendar and even conversations in Wave from Socialwok’s Friendfeed-like interface. You can even sign in with your Google Docs credentials. But with the new gadget, Socialwok’s interface will appear within Gmail’s main canvas. Users can view, post and comment on updates; access feeds, files and Google Docs and search for posts, people, feeds, and files. Socialwok, which employs a freemium model, has steadily been adding features and improvements to its application, including releasing a new version of its HTML 5 mobile version for Android and iPhone browsers. And the startup has managed caught Google’s eye. Socialwok was chosen as one of the showcase companies for AppEngine technology at this year’s Google IO Developer Sandbox (Socialwok is powered by Google App Engine). And the startup wrote a blog post on Google’s Enterprise Blog about Socialwok. Over 4,000 domains and thousands of users are using Socialwok. As we wrote on our initial review of Socialwok, if Google doesn’t buy the startup, they should at least heavily promoting what they’re doing. And it appears that Google has taken the latter route. For now. There’s no doubt that Socialwok could face the same fate as Google Docs killer and collaboration platform Etherpad, which was acquired by Google last year.